The digital transformation has demanded a lot from businesses during recent decades. In many cases, companies have been forced to adapt to evolving technologies at rapid and often uncomfortable speeds. Early adopters of emerging technologies can gain a significant competitive advantage in this data-fuelled digital landscape. Luckily, my peers and I at G2 Crowd have identified a number of digital trends that look past marketing jargon and buzzwords to help companies consider cutting edge tools and drive change. Yes, they include blockchain, artificial intelligence (AI) and the internet of things (IoT), but not in an effort to obfuscate the topic or increase demand for unnecessary tools. These topics have clearly gained momentum in recent years, but are just not being applied to real-world scenarios. Digital transformation can mean everything or it can mean nothing. Today, much of the digital transformation is seen as an integral component of unified business practices. Others may still, somewhat justifiably, fear change. Evolving can be risky, expensive and time consuming, but it’s still necessary. 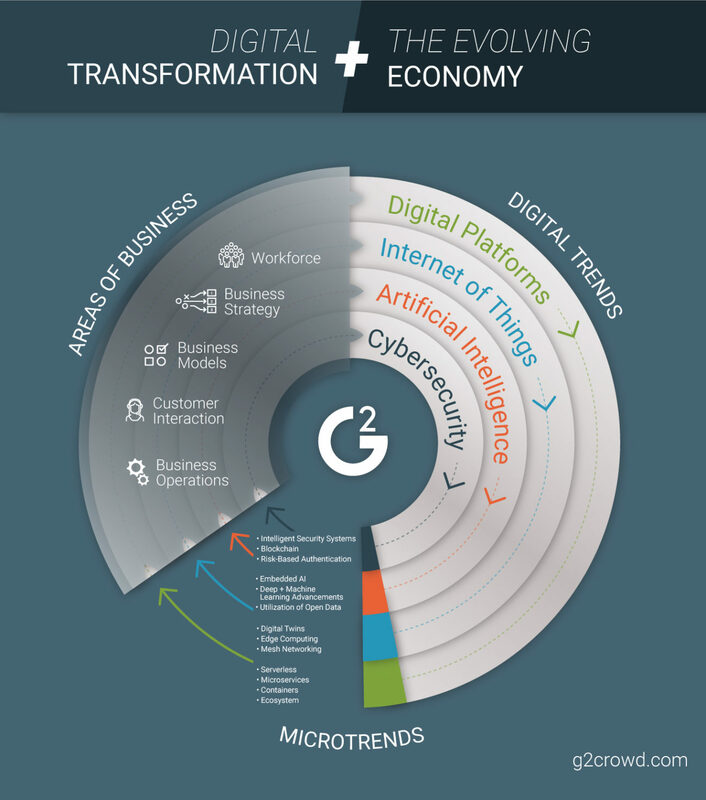 Our trends have been segmented between AI, cybersecurity, digital platforms, and IoT trends. AI and IoT are newer overall, but components of the digital ecosystem and cybersecurity technology are rapidly evolving. In order to adopt these new tools and use them efficiently, users have to know where they fit into a company’s business operations, model and strategy. It may be easy to see how AI can fit into a data scientist’s objectives, but it’s not always obvious how marketing, sales and development might be affected. The same goes for IoT, security and digital platforms. Companies like GE are already demonstrating successful evolutionary practices. Despite the honor of “worst performing stock of 2017,” losing about 40 percent of its value, the company has successfully shifted its focus to plan for the future. They’ve invested in AI and IoT by adding stocking their workforce with experts and launching a new digital platform. The 1.26 century old conglomerate came to terms with the SaaS-like, subscription-based business model breach the gap between industrial, real-world appliances and data-centric enterprise IoT applications. We’re tracking similar achievements from corporate behemoths like GE to tiny tech startups and vertical industry players. These factors are serving as anchors for the digital transformation and their impact on business modernization is well-worth discussing. It depends who you ask, but AI is considered to be anything from our saving grace to an existential threat. For businesses, a skynet-like apocalypse seems much less realistic than a product feature for machine learning-based analytics a helpful chatbot. In terms of trends, we’ve identified impact in a few specific components of AI: embedded intelligence, machine learning as a service (MLaaS) and open data. Embedding AI into applications can do a lot from providing actionable insights via advanced analytics, to simply improving overall customer experience. It will significantly improve task automation, decision making and business process management. Companies are already opting in to AI-based SaaS applications. An example of this is with CRM software, specifically Salesforce’s Einstein solution to expand automation utilize thousands of data points to improve lead scoring, prospecting and save time overall. Microservices providers like Amazon, Microsoft and Google are hoping MLaaS solutions will be as lucrative as their SaaS, PaaS, and IaaS solutions. Instead of developing their own unique machine learning algorithms, companies can simply subscribe to their offering and super-power their applications nearly instantly. Open data is a bit different and a bit less tangible than the others, but can drastically improve the scope of information an AI solution is pulling data from. Open-source datasets add additional image, geospatial, text and transport data for big data processing engines to consume and spit out. Data-sharing won’t be confined to the CRM space, as companies are becoming more likely to share their data if it means access to exponentially more information and significantly improved predictive analytics, automation and accuracy. Blockchain technology was included in our security section, but it can facilitate a wide range of capabilities. It’s bigges timpact will be in fintech and finserve, but it’s already being applied to cloud storage, security and supply chain applications. Finance-focused offerings are utilizing blockchain for its encryption and transparency characteristics. It can secure information for e-commerce payments or financial managers and streamline operations with frictionless transactions. Industry leaders like Goldman Sachs, Santander and BNY Mellon are already leading the way with firms push trillions of dollars into blockchain technology. Other markets embracing the technology include virtually anything that can benefit from secure transactions or data encryption. A few cloud storage and database companies have embraced blockchain to distribute storage and encrypt files. Any a number of SaaS tools could integrate some kind of blockchain as a service to instantly bolster security. 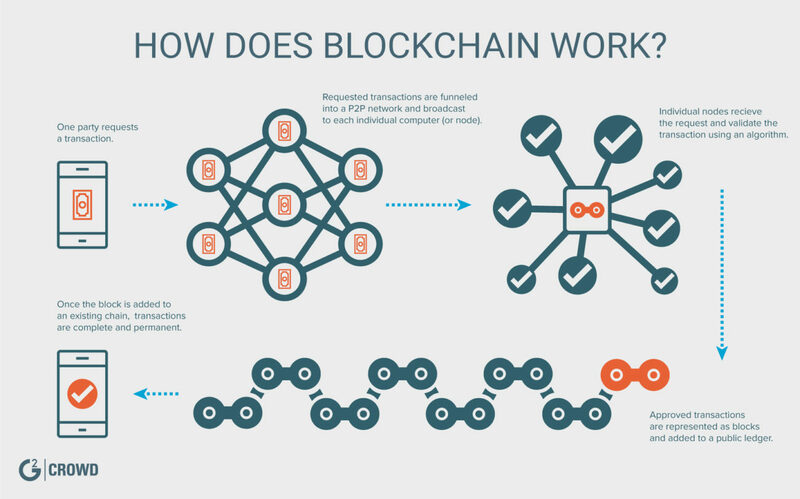 At its core, blockchain is a cybersecurity mechanism designed to decentralize and encrypt information. That’s the reason so many cyber criminals use cryptocurrency for their nefarious practices. Despite that, companies and individuals can benefit from encryption equally in an era when sensitive information is so valuable. New endpoints from IoT-enabled devices must be secured somehow and either AI or blockchain-based solutions will have major impacts. AI can improve stream analytics and facilitate continuous monitoring. While Blockchain solutions can encrypt the massive amounts of data being transferred between endpoints. Identity management via biometric and intelligent authentication is emerging as well. Bank of America started the trend in 2017 by partnering with Intel to bring biometric validation to online banking. Adding requirements for fingerprints or retinal scanning are obvious solutions. But tools for risk-based authentication are a little less intuitive. These tools analyze a variety of factors to quickly compile risk rating by utilizing machine learning. They take into account user behavior, locations, network variables and many other factors to identify potential threats. In the case they do, users are restricted from accessing company systems or prompted to submit additional verification such as an SMS code, biometric factors or a security question answer. While security remains a large concern, IoT is rapidly transforming manufacturing, agriculture and shipping, just to name a few. Interconnected machines from medical appliances to construction equipment can become self reliant, self fulfilling, self monitoring. As G2 Crowd’s Kara Kennedy puts it, “IoT is the next industrial revolution.” It’s led to an enormous influx of data and allowed companies to collect, analyze and deliver information in an innovative and accessible way. Mesh networks are one way companies are enabling smart devices to communicate. These interconnected nodes transmit and receive signals wirelessly without reducing signal strength no matter how far they are from the source. Imagine a 40,000 acre, mesh-powered wind farm. The furthest turbine in the field would remain just as secure and connected as the closest. Edge computing is another IoT-focused trend that improves computing and data processing by localizing initial storage before cloud deployment. The practice decreases latency and improves efficiency. For example, GE’s IoT platform, Predix, supports thousands of edge devices, enabling faster processing with low latency, making analytics more efficient and impactful. Industries like manufacturing, that are less tech-savvy on the surface, are embracing IoT through the use of digital twins, virtualized appliance replication. It’s a proactive model that can reduce endpoint failure and strengthen machine analysis through continuous monitoring. Digital platforms are a core component of the modern business. PaaS, IaaS, and microservices provide a significantly more dynamic application model than traditional development. Today’s digital ecosystem utilizes microservices, containerization and serverless computing technologies to manage core business functions. The microservice architecture provides a malleable, plug-and-play model to quickly add or remove desired functionalities. It’s the basis for service providers like AWS and Microsoft to deliver virtually any capability a company could want from cloud hosting and storage to databases and development tools, all in a scalable and affordable manner. Containerization technology, prompted by the rapid growth of Docker, is improving security, development speed and application functionality. Containing an application inside portable, distributed components helps companies reduce failover through segmentation and reuse existing application components. Resource isolation also improves efficiency and optimize networks. Serverless computing was the final component of our digital platform trends. It’s a rapidly evolving model that allows users to manage applications and resources as needed, rather than relying on dedicated servers. A Markets and Markets report predicts the serverless market will grow from a $1.88 billion market from 2016 to $7.72 billion by 2021 (411 percent). The technology will improve scalability, security and agility for application management. Companies developing tools related to these trends will continue gaining traction and receiving venture capital funding. All while established enterprises hope to maintain pace or lead the way. Many of these technologies have significant overlap, but interacting technologies will only complement and improve each tool’s capabilities. Successful adoption of one may set companies ahead of the pack, but cross-category utilization can build an ecosystem to be reckoned with. The digital transformation is constantly evolving and these are simply a few components we see thrusting their way towards innovation.